“Happy 4th of July,” everyone! I am doing generally very well and enjoying the 4th of July with my family with BBQ and the fireworks! I had a PhD graduation ceremony! 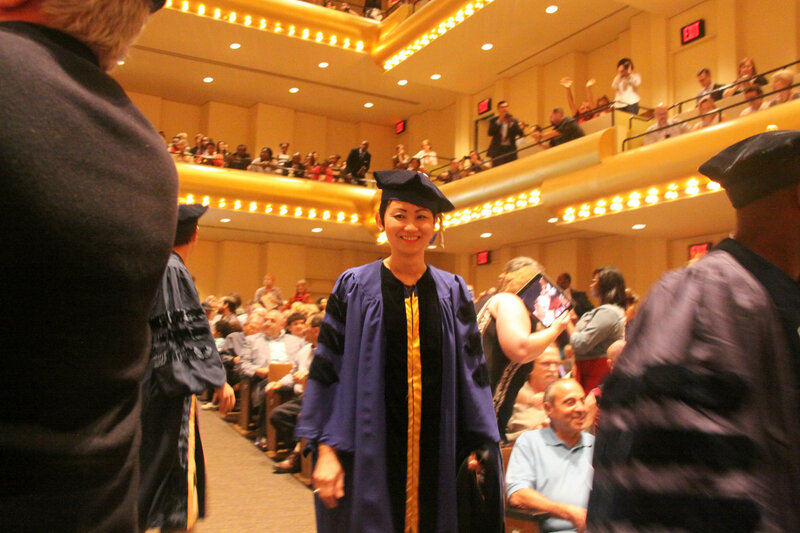 I am even more officially, well… I had been since February… but, Dr. Yoko! I started the PhD program in 2001, that is 15 years of my work. I am so proud to be able to come this far. Thank you so much for supporting me, my family, friends, colleagues, my blog readers, and my professors. Along the way, I started to teach Economics at US colleges since 2004, got married, had a baby, had been raising my son in bilingual, got breast cancer, completed chemotherapy, finished reconstruction, completed my dissertation and the graduation ceremony was the closing of the PhD program! I marked the 2nd year anniversary of the cancer diagnosis on May 19. Today, 2 years ago, it changed me so much. I have attended a wedding in Japan about 2 weeks ago. My friends from high school were there and some of them, I had not seen them for 20 years. Many of them didn’t know about my cancer. I joined a photo session at SHARE -support for breast and ovarian cancer- yesterday. I only had one hour to be there and I had fun of getting some photo shooting done with other survivors and SHARE stuff members. These photos will be used for their publications. Look out! Yesterday’s breast cancer event went successful! I was one of panelists at the event and shared a part of my stories. Some issues that young cancer patients may face such as career, raising kids and future pregnancy issues during treatments were discussed. It was a meaningful event to me. I hope to encourage people goes through cancer treatments.